J has been very adamant that date night would never consist of going to Texas Roadhouse. That may sound obvious but a lot of my friends from back home in a small town in Illinois make such a big deal about going to Texas Roadhouse when they get a night away from their kids. You would think they were going to The French Laundry by the way they talk about it for weeks leading up to and following the meal. This week has been a crazy week at work and I ended up working a double shift Thursday night in to Friday morning. They ended up giving me Friday night off so after a nice long nap, I asked J if she wanted to go to dinner. Being a smartass knowing she wouldn’t go to Texas Roadhouse, I suggested Texas Corral. 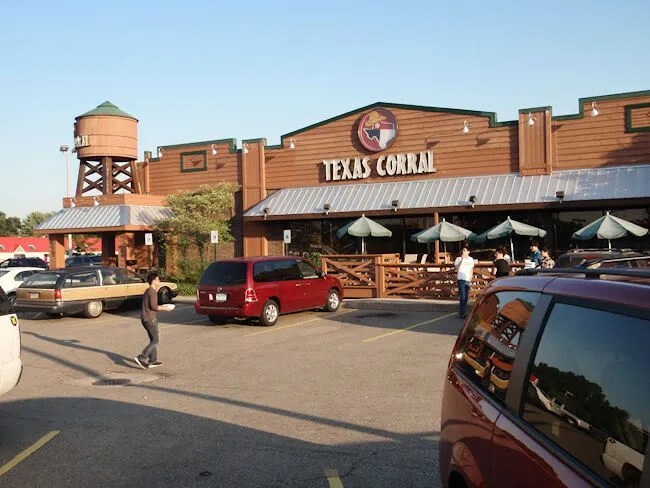 The Kalamazoo location of Texas Corral is in Oshtemo Township on West Main just off the US 131 exit. The chain is pretty small with only eight locations in Northwest Indiana and Southwest Michigan. If, for some reason, you would not be paying attention and thought you were walking in to a Texas Roadhouse, you probably would never realize you were in the wrong place. 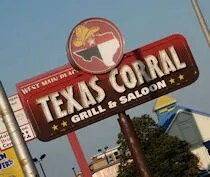 Texas Corral has a lot of similarities to the larger chain. There are buckets of peanuts on the tables. 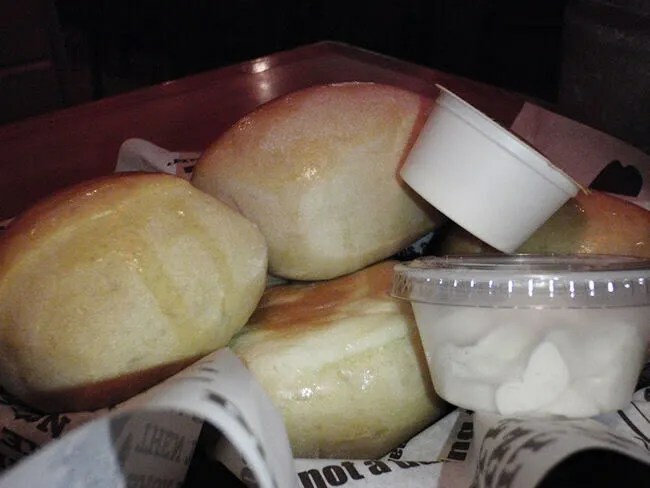 They bring warm, buttery rolls with a cinnamon butter to the table in what seems like and endless supply and their menu centers around BBQ. Even the set up and decor of the restaurant make you feel like your at the other place. J and I were taken to a booth right across from the bar and instantly, I went for the bucket of peanuts. In a 28 hour period, the only thing I had eaten was a six inch sub from Subway. Needless to say, I was pretty hungry. 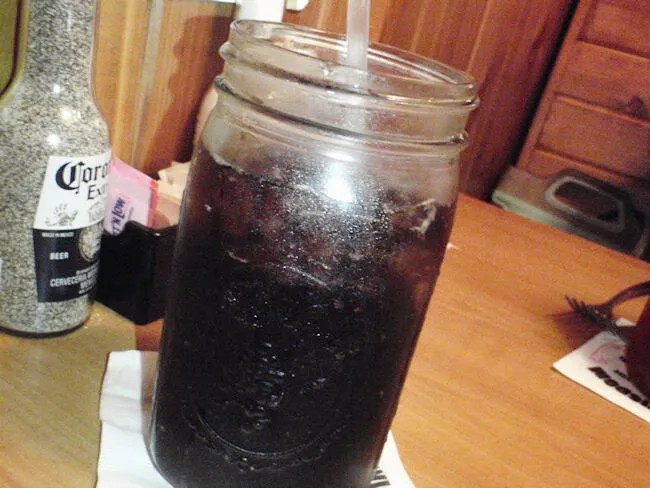 Between peanuts, I did have enough time to put in my order for a Pepsi which is served in a mason jar. J ordered a sweet tea, but they were making a new batch or switching out the lines or something and they brought her a regular iced tea for the time being. They eventually did bring a sweet tea which J said was much better than the regular. I was kind of in the mood for BBQ, but I was also kind of in the mood for a burger. The burger menu was pretty much a create your own as they didn’t have very many options. I ordered a burger with bleu cheese. It’s a pretty standard 1/2 lb patty that I had cooked medium with a large handful of bleu cheese crumbles. 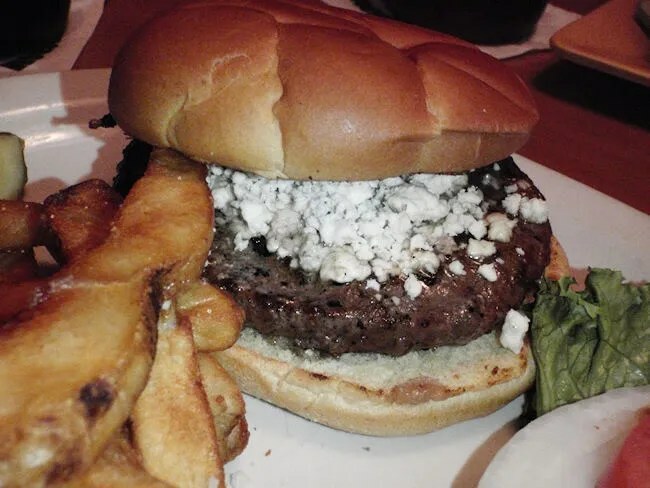 The burger was juicy and just a bit pink in the middle and the large portion of bleu cheese added a tangy bite to the sandwich. For my side I chose the steak fries. There weren’t a lot of them, but they were cooked all the way through to a nice golden, crispy brown and seasoned pretty well. J even passed on the pulled pork sandwich and instead, went with a salad. She went with an option called the Texicali Salad. 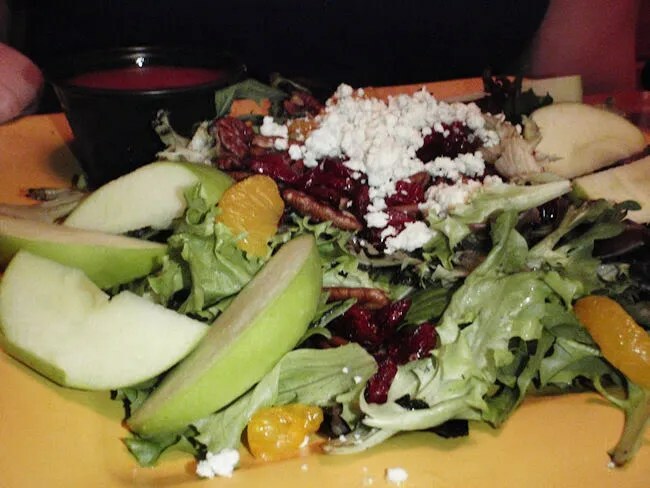 I know I’m going to leave something out here, but the bed of mixed greens was topped with apples, dried cherries, bleu cheese, and walnuts. The dressing is a raspberry vinaigrette. I think she was really surprised by the salad and really seemed to like it. It was more than she could eat though so she left a little on the plate, but that wasn’t because she didn’t like it. Our bill was a little over $22. Not bad for a casual dining chain because we both left stuffed which turned out to be a good thing since I got called back in to work. There really isn’t a whole lot of difference between Texas Corral and Texas Roadhouse. The food was what you expect from this kind of place and I think we both left happy. It’s not really our kind of place but, to be fair, no casual dining chain is. The food is good, the service was good, and they have a bucket of peanuts on the table…really, isn’t that all you need?